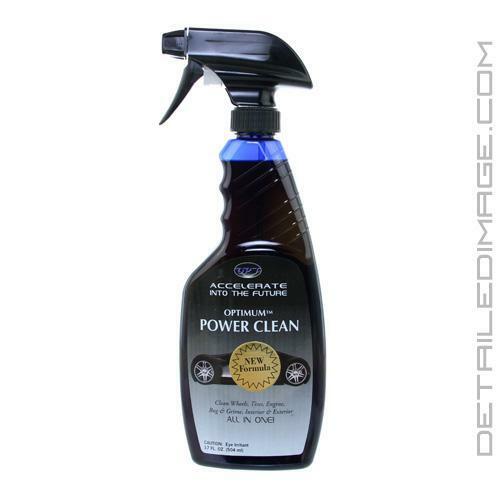 If you want to safely degrease your vehicle the Optimum Power Clean is an excellent choice for you. It is an environmentally safe product that can help you clean your paint, wheels, tires, engine bay, wheel wells, trim and so much more. The strong cleaning agents break down bug smear, road grime, brake dust, dirt, etc. The washing process can be prone to adding ultra fine scratches to the surface when you have to scrub extra hard or large contaminants become trapped in your wash mitt. Before washing we highly recommend you pre-treat the surface with the Optimum Power Clean. Simply spray areas with heavy build-ups and it will safely break them up, then just rinse the surface and you'll instantly notice the build-ups quickly dissolved. For extra stubborn stains apply a second treatment and let it sit for at least 1 - 2 minutes and then agitate with a paint-safe mitt or sponge. It is not just effective on paint, use it on wheels, tires, engine bay and so much more! The Optimum Power Clean is a great value because you can dilute it 3:1 with water or use it full strength. It is unbelievably easy to use, highly effective and a perfect product for virtually any detailer. Power Clean really is a wonderful APC. If you are looking for a powerful yet safe APC, look no further than Optimum's Power Clean. It really is an amazing all around cleanser that does dirty work and gentle cleaning. 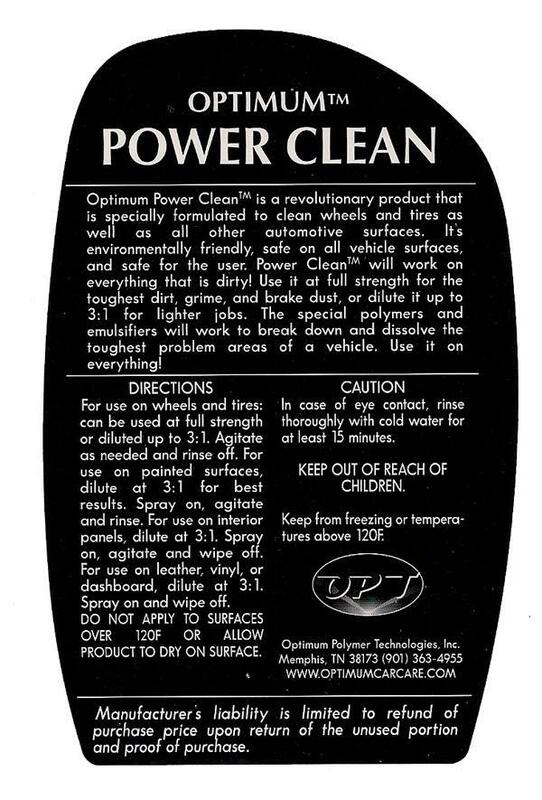 Optimum Power Clean is a revolutionary product that is specially formulated to clean wheels and tires as well as all other automotive surfaces. It's environmentally friendly, and safe for the user. Power Clean will work on everything that is dirty! Use it at full strength for the toughest dirt, grime, and brake dust, or dilute it up to 3:1 for the lighter jobs. The special polymers and emulsifiers will work to break down and dissolve the toughest problem areas of a vehicle. Use it on everything! For use on wheels and tires: can be used at full strength or diluted up to 3:1. Agitate as needed and rinse off. For use on painted surfaces, dilute at 3:1 for the best results. Spray on, agitate and rinse. For use on interior panels, dilute at 3:1. Spray on and wipe off. DO NOT APPLY TO SURFACES OVER 120F or ALLOW PRODUCT TO DRY ON SURFACE. Cleaned paint from tough winter grime located at the rear of oxford white car easily using prescribed 3:1 dilution ratio. I figured I would try a product that Ive heard recommended so many times on forums. I diluted the product 3:1 at first and then went to 10:1. Dirt and debris melt away with little agitation. Door jambs are spotless, interior is dirt and grease free and most of all there is no sticky residue left behind! Definitely a top 5 APC. I'm used to buying dollar store degreaser so it was a little hard for me to spend the money on this, but I'm glad I did! This stuff works great and different dilutions give you different results! I'm now a believer!